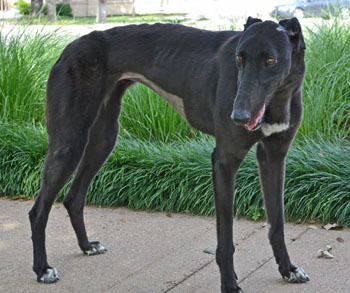 Truffles is a 1½-year-old black female with white tipped toes born in October 2010. She has an adorable little splash of white just in front of her left ear. Her tattoos are still being researched, but Linus is her littermate. She was turned in to an Amarillo shelter by a coyote hunter. This happy, little girl would love to find a family of her own! Truffles is not cat tolerant and has yet to be tested around small dogs. Truffles is such a sweet girl - quick to give a kiss with her cute forked tongue or receive a one on the white kissing spot on her forehead! (She hasn't shared how her tongue is missing a chunk and she doesn't seem to mind - we think she barks with a lisp now!) Truffles relies on other dogs in the house to show her what to do. She wasn't sure about going on a walk at first and now she stands in the prep area to get leashed up. 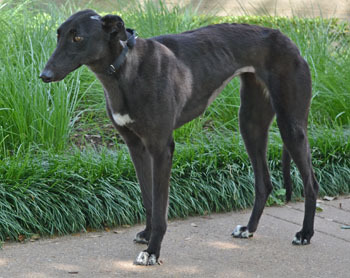 Truffles does need a home with a yard as she is a bit private about doing her business on a leash. Velcro is an accurate description - she wants to be nearby and follows us from room to room. If you get on the floor with her, she'll love on you with all her heart. 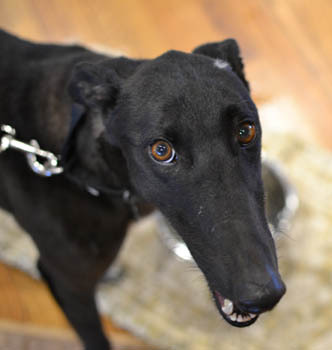 This is one beautiful black greyhound with big brown eyes that is ready to be your forever friend.